Learn important computer fundamentals while creating professional looking documents with Microsoft Office! Cleveland Institute of Electronics created a distance learning course that will train individuals with little or no computer background how to run and maintain a PC and be proficient with Microsoft Office. Step-by-step learning labs cover real world projects in Excel, Word, Access & Power Point. Get started on or continue your computer education online and gain valuable computer career skills employers are looking for without leaving your home! Course 4C includes 30 lessons with instructor support that culminates in a Diploma from Cleveland Institute of Electronics. Start training to become a Information Clerk, Data Processor or Computer Assistant today! 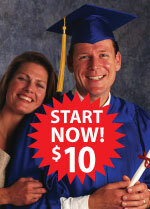 Enroll on-line in Course 4C for only $10 down. Microsoft Office is a software suite that consists of different applications that complete different activities. MS Office is by far the most widely recognized software suite in the world. Microsoft Office can be found in most office environments and a technical proficiency in this software is often required for employment. Be in Demand for a Great Job! The U.S. Department of Labor* has the following expectations for Information Clerks and Data Processors. Employment of Information Clerks is expected to grow faster than the average for all occupations through 2018. This increase will result from rapid growth in services industries—including physicians’ offices, law firms, temporary-help agencies, and consulting firms—where most are employed. Job prospects will be most favorable for those with the best technical skills—in particular, expertise in appropriate computer software applications. Data entry and information processing workers must be willing to upgrade their skills continuously in order to remain marketable. This work frequently serves as a steppingstone to higher paying jobs with increased responsibilities. *Occupational Outlook Handbook - U.S. Department of Labor. CIE makes it easy to get your networking training started with absolutely no risk to you while providing you with all the assistance you’ll need to succeed. Earn a Diploma from a school that has been teaching via distance learning for 80 years. * You will need access to Microsoft Office to complete the project labs. If you need this software you can enroll and then you'll be eligible for Microsoft's drastically reduced academic prices in CIE's Bookstore.